As follow up on my Including SMILES, CML and InChI in blogs blog last week, I had a go at Greasemonkey. Some time ago already, Flags and Lollipops and Nodalpoint showed with two cool mashups (one Connotea/Postgenomic and one Pubmed/Postgenomic) that user scripts are rather useful in science too. I can very much recommend the PubMed/Postgenomic mashup, as PubMed has several organic chemistry journals indexed too! So, how does this relate to my blog of last week? Well, would it not be nice that if your blog uses the markup as suggested in that blog, that you automatically get links to PubChem and Google? That is now possible with a small GPL-ed Greasemonkey script called blogchemistry.user.js. 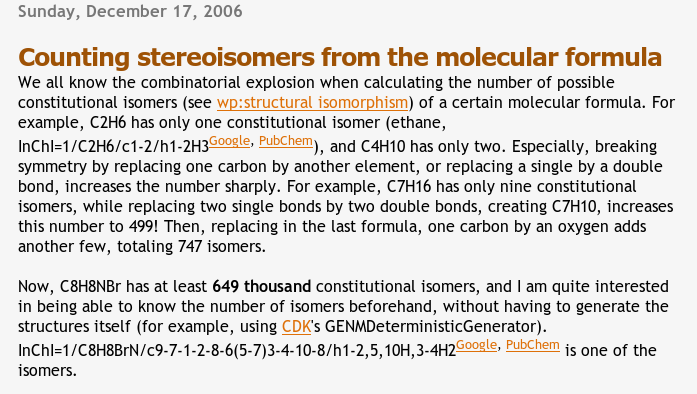 Note the superscript PubChem and Google links. Update: there was something wrong with the download, which I just fixed (19th, at 8:45 CET). Please download once more to get it working properly. Egon - this is very interesting. Can you provide a bit more info about what to do after the installation of the script. I assume I need to add Google as one of the websites but where do you enter the search terms? After installing the Greasemonkey plugin, and the script I wrote, you do not need to do anything on the client side. What you would need to do for the UsefulChem blog, is to use the <span> markup as indicated in the blog on including InChI/CAS/SMILES in blogs items a week ago. If you can translate [6.6]chiralane, C27H28, into notation and get it back as a molecule then your software is working. It is that rare molecule that does not have a flat graph. Its undistorted tetrahedral chiral center bears four identical groups. HyperChem chiralan.hin supplied on request (e-mail atop linked page, above). NIST's commercial sterochemistry software module was quietly rewritten. Script works like a champ. But, why link to google? Might as well just use pubchem where you can look up the properties you'll be searching google for in the first place. 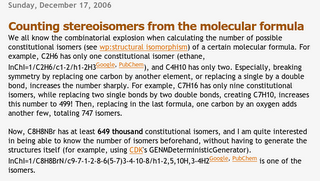 Noticed pubchem links are missing a closing quotation mark for links generated from SMILES code. The link to the file on this page is not work http://www.woc.science.ru.nl/devel/egonw/blogchemistry.user.js. Can you tell where to get this file? Macademic... oops. That webpage is indeed down. However, it has been replaced by the sechemtic user script I menion here in the comments.